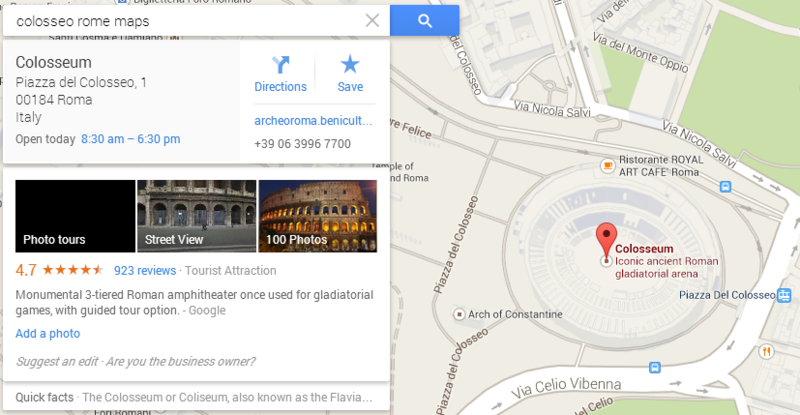 Back in 2012, Google maps was given an extra feature – Photo tours. The announcement here on the Google LatLong blogspot site explains how they used to work… sometime in early May 2014, photo tours seem to have been removed – as all links to individual photo tours no longer work. Every photo is attributed to its contributor, and the more photos people share, the better the tours get. So if you have great photos of places you’ve visited on Picasa or Panoramio, make them public so they’ll be eligible for inclusion in these photo tours! Google Maps Photo Tours are guided, 3D tours of thousands of landmarks and locations around the globe using photos submitted to Google Maps. Search for a city or country and look in the info cards. Search for a landmark and open the carousel in the bottom right corner and select the box with the photo tour icon . Here are a few examples of locations with Photo Tours: the Colosseum, Hagia Sophia, Kōtoku-in, Mont Saint-Michel, Moraine Lake, Sagrada Familia, Shoshone Falls Park, St. Mark’s Basilica, the Trevi Fountain, and the Arch of Titus. Photo Tours are built from photos that people have submitted to Panoramio or uploaded to a public Picasa photos album. Google Maps uses state of the art computer vision techniques to organize and relate all the photos in 3D and then group, or cluster, the photos according to what’s seen. If a lot of people take photos in front of a famous cathedral, for example, an algorithm selects the best photo. Photos that someone takes down from Panoramio or Picasa will likewise be removed from Photo Tours. Learn how to add your own photos. To report a photo, simply click the Report a problem link in the lower right corner when the inappropriate image appears. You can then submit a report for that particular photo on the photo site that it came from. Street View: See street-level imagery of a particular area. Earth: See satellite imagery as a globe with 3D, life-like imagery, or watch a 3D Earth tour. Satellite: If you’re running the new Google Maps in Lite mode, your Earth view will appear as satellite imagery instead. Business View: See inside a business without leaving your computer. Or, add your own photos of the place. Photo Spheres: See user-generated panoramas, and then create and share your own photo sphere. Photos: View photos taken by users from all around the world and see photo tours of landmarks. Well, for the moment, it appears that photo tours have been removed from Google Maps. Perhaps they are to be integrated within StreetView in the near future – as the products shared similarities and mosaicing images is useful to provide a seemless transition when using Streetview. The photo tour feature may simply get absorbed by StreetView, and is awaiting re-release. What do you think has happened to photo tours in Google Maps ? Will they return as part of Streetview? Search Intent: Is the arms race for links finally over ? Despite mounting evidence, businesses of all sizes cling to an outdated understanding of search engines, in particular there is a strongly held belief about how Google decides which sites to present in search results. Over the past few years, Google has been placing more weight (!) on machine learning than on simpler measures such as Page rank, yet a fuller appreciation of how this affects positions in search results and subsequent traffic flows is not being explained by the industry. Even when we know what we are doing has dubious benefit at best. Our industry continues to mislead business by promising to ‘build links’, seek out ‘high authorty domains’ and generally waste clients budget by engaging in out-dated practices that are highly unlikely to benefit the client in the long term. I am not referring to spammy automation, we have all moved on from those days, I am referring to continuing to ‘build’ links at all. Are links really that important in 2013? The most prevalent belief is that sites are ‘rewarded’ for simply having more links from high authority sites than their competitors. This belief is based in turn on a belief that links correlate to rank, and that rank can be somehow ‘cemented’ by building links. Consequently, agencies respond to competitive RFPs by agreeing to build links rather than challenging the clients firmly held beliefs. 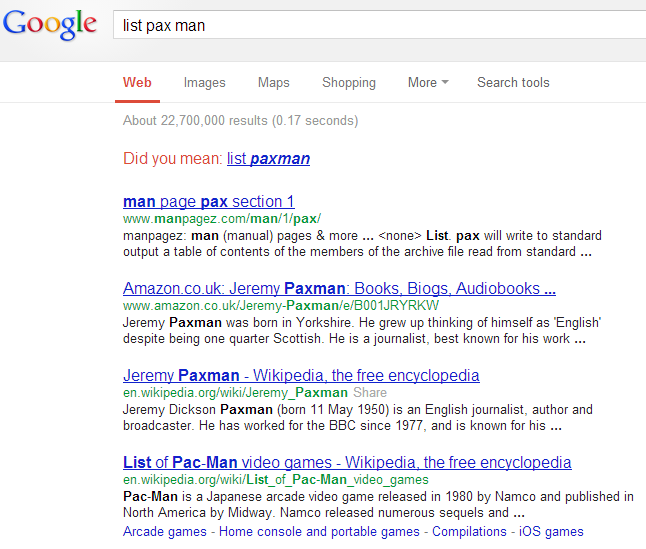 Notice that Google suggests ‘pax man’ may be a mistake, I am presented ‘paxman’ as a single keyword suggestion. Notice also that Google includes a link to Wikipedia, for a list of ‘Pac-Man’ video games – even though I did not type Pac-Man. Both second and third results relate to Jeremy Paxman. The second result contains the word ‘list’ once on the page (Amazon wish list). The third result does not contain the word ‘list’ at all. The fourth result shows how hard Google is working to provide all the possible options for my initial query. Now let’s look at the number of inbound links for each result… if links were an important factor in the results set, then it would follow that the result suggested in #1 would have a handsome quantity of inbound links. Now Google understands. We have achieved ‘entity disambiguation’ – a search engine nirvana. We don’t mean ‘Pac-Man’ and we don’t mean ‘Paxman’. 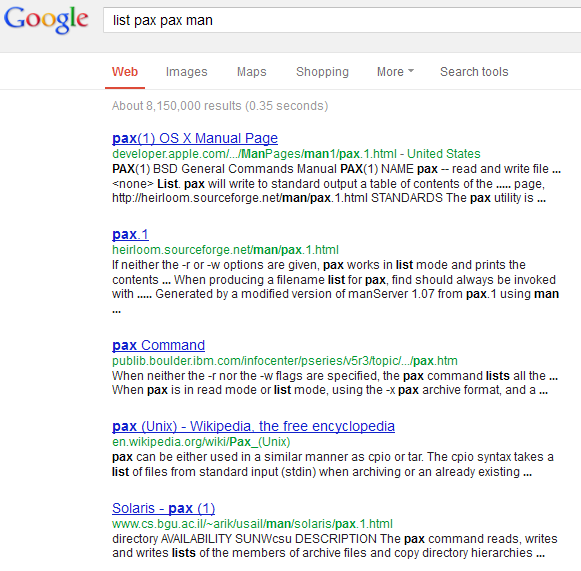 The repetition of the keyword ‘pax’ has ensured a full page of results about the Unix command ‘pax’. A URL from the apple development site takes its place. In fact, the top results are now dominated by well frequented sites such as Apple, sourceforge, IBM and Wikipedia. The domain ‘manpagez.com’ is not a competitor in this new well-defined search space – which is odd, as it used to be the best possible match, just one query ago! If Google had a more ‘authoritiative’ match for the original query – if we assume links convey power and authority, then why wasn’t the result from Apple presented in that first search test ? Look again at result #3 above from IBM. There are NO back links reported to this page by MajesticSEOs historic index. The results above reflect the ‘importance’ of the results in relation to the query based on machine learning – not simply accumulations of links. In order to be presented in SERPs, considerable effort must be made in ensuring that the clients site serves the need of the audience. People looking for man pages on the pax command are the sort of people that visit developer.apple.com. Once Google has clear signals that the query is for the Unix command and not ‘Pac-Man’ or ‘Paxman’, then the SERPs are populated with the domains that serve this audience best. Unfortunately for manpagez.com, they do not attract and retain attention sufficiently to be returned for the second search. I encourage you to try this for yourself and further to demonstrate to clients the dissociation of links with position in SERPs for queries. There is simply little to be gained by adding links to a site – the most important challenge is to give visitors what they want on the site and be clear about the content offered. Growing an audience that uses the site regularly is more important than just adding links. Work on building advocates and the links will follow to support that effort. If you work on building links, then you are only increasing risk for the future. A new tool for helping site owners with structured markup for events has appeared recently in Google Webmaster Tools. At the moment the tool is restricted to Events markup, and the video shows you how to set about Highlighting. 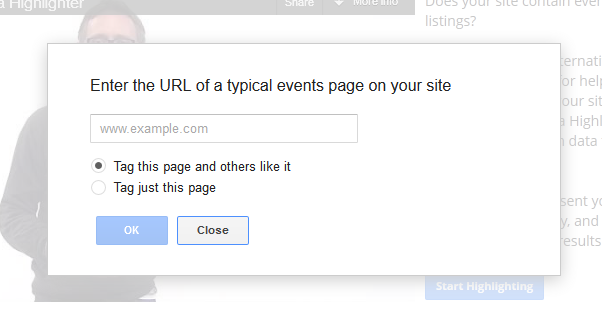 All you need to do is enter the URL of the page containing events to start with. This looks to be the start of a move by Google to make decorating html and adding schema somewhat easier than relying on development cycles. As we move into 2013, the data highlighter tool is likely to become much more comprehensive.